5 Bedroom House with Pool/Spa - Classic & Quiet - You Will Love It !!! A lovely, 5 bedroom, desert ranch-style home ( 2,740+ sf) w/ large pool & attached spa. 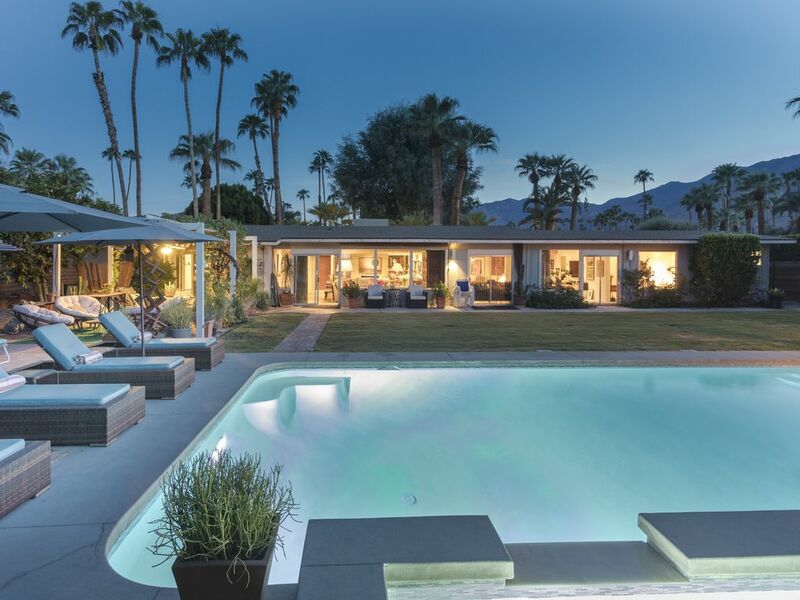 Located on a classic "old Palm Springs" quiet street in the desirable south end of Palm Springs. Beautiful new designer furnishings with fully-equipped kitchen, linens, etc. 55" flat screen smart tv in den and 50" flat screen in living room. * One king-size, two queen-size, two bedrooms each with 2 twin beds. * Grapevine covered patio with gas grille. * Large pool and attached spa (Heated for extra daily charge). * Daily/weekly maid service available at extra charge. Owner is friendly. Outdoor Smoking Only!!! Leonard Colombo Dog owner, Tennis player, Real Estate Broker If you are interested in purchasing property in the Palm Springs area, please let me know. !!! Located on a quiet street with a large pool and spa with a grand view of the mountains. Classic 'old' Palm Springs ranch style neighborhood. Many mature fruit trees and palm trees on property. Close to downtown. Downtown Palm Springs is about an 8 minute drive from the house. It's also near the Convention Center and the Casino. Grand View of the San Jacinto Mountains !! 4 televisions including a 55" flat screen smart tv. Pool and spa. Pool/spa heat is an optional and an additional charge on a per day basis. Cost: $180 to preheat pool to 84 degrees plus $75 per calendar day. Full Digital 55" Flat Screen TV, Large Pool and built in spa with Walled Private Yard, Gas BBQ, Grassy Backyard with Vine Covered Patio and a poolside patio, Incredible View of Mountains!, Quiet neighborhood. It's a great home, you'll love it.